Quantum Wellness: A Practical and Spiritual Guide to Health and Happiness is a program created by the New York Times bestselling author, Kathy Freston. Freston has appeared on the Oprah show and Oprah followed the 21-day detox diet that is featured in the book. According to Freston, Quantum Wellness is a higher state of being that we are all capable of achieving. She says that the quantum leap to wellness occurs as a result of making a series of many small steps, not just doing a detox diet, and she suggests making gradual but progressive lifestyle changes in order to achieve this goal. The book starts with a “Wellness Checkup” where readers are guided through a series of questions to help to identify the areas that need attention. Quantum Wellness recommends a vegan diet, not only for its health benefits, but also because most meat comes from animals that have been inhumanely treated. She also highlights the negative toll on the environment that is created by a diet that is high in animal products. Being aware of the impact of our dietary choices on other beings and the environment is a part of what Freston refers to as “conscious eating”. She acknowledges that it may be difficult for meat eaters to adapt to a vegan diet so she provides many tips and suggestions to make the transition easier. To get started she recommends undertaking a 21-day cleansing program where you will eliminate all animal products as well as caffeine, sugar, alcohol and gluten. The cleanse should be repeated once or twice each year. She says that doing a detox is the best way to give your body a break from digesting heavy foods and to let go of emotional eating and addiction to sugar and caffeine. At the end of the cleanse you should have more energy, better digestion and relief from joint and muscle pain. Fresh fruit and vegetables, quinoa, brown rice, gluten-free bread, tofu, lentils, peanut butter, almonds, soy yogurt, soy burger, soy hot dogs, avocado. Exercise is one of the eight pillars of wellness and Quantum Wellness recommends at least 30 minutes of exercise on at least three days of the week, preferably outdoors. 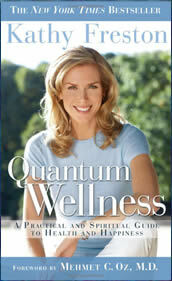 Quantum Wellness: A Practical and Spiritual Guide to Health and Happiness retails at $23.95. Encourages the intake of a variety of healthy foods. Increases awareness of what and why you are eating. Acknowledges the role of psychological factors in well being. Encourages an environmentally friendly lifestyle. Suitable for most dieters with food allergies. Includes a meal plan with recipes and shopping lists. Some dieters may prefer not to eat a vegetarian diet. Encourages consumption of processed soy products. Does not specifically target weight loss. Dieters may experience withdrawal symptoms such as headache and fatigue when eliminating caffeine and sugar. The spiritual aspect may not appeal to dieters who prefer a simple diet and fitness plan. Quantum Wellness explores concepts that are generally addressed in self-help books as well as looking at lifestyle factors such as diet and exercise. It will appeal to readers who want to improve their health and are interested in a vegetarian lifestyle as well as the psychological and spiritual aspects that are involved in the creation of well being.